Until I tested for Taymer’s Caribbean Vegan I don’t think I’d eaten any food from that area. There are parts of England with Caribbean shops and restaurants but I don’t think many of them are vegan friendly. If anyone knows otherwise please let me know as I’d love to try them when I’m on my travels. If at that time I’d have been asked for my ideas on Caribbean cooking, I’d have said “Jerk Chicken, Rice and peas, and lots of pineapple”. Ha. How wrong I was and how much I’ve learnt. 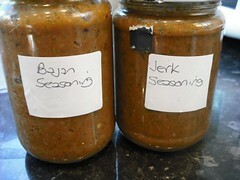 When you get the book I recommend that the first thing you make is a batch of Bajan Seasoning. It underpins many of the other recipes in the book, but you can use it in lots of other of your normal soups and stews too. Once you’ve got this under your belt many of the recipes become a lot easier – it’s too easy to put off making a dish that needs another recipe as a base otherwise. Once you’ve got the ingredients for this, the food processor does all the work, so it’s really easy. I’d had lots of experience with making my own Indian and Thai blends but this is something very different. The thyme and the cloves are what really set it apart from other seasonings and give you a flavour of the Caribbean. He doesn’t read this, so I’m not spoiling any surprises, but my Dad has been to Barbados a few times and is getting a jar of this from me for Christmas. It lasts for absolutely ages and has so many uses so I think it may be the most useful present he gets. Oh, yum! I just got this book yesterday and the seasoning blends were the first things I wanted to attempt. I am so totally unfamiliar with the cuisines–which I absolutely love in a vegan cookbook! cool post! I am looking forward to getting her book. I’ve got a few new books on my list, and this is defintely one of them. 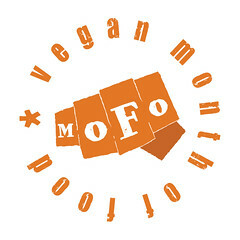 I’m loving your mofo theme!